An updated look and much-needed, timeless message will engage existing fans of bestselling Streams in the Desert brand and will reach out to new readers looking for sustenance and replenishment. Capturing the timeless essence of the original devotional with fresh, contemporary wording from editor Jim Reimann and New International Version text, each devotion lends guidance and hope while encouraging a deeper faith walk. This classic devotional will appeal to both men and women of all ages thanks to a gender-neutral design and devotional entries on a wide variety of topics. An updated cover will help distinguish this from older product. 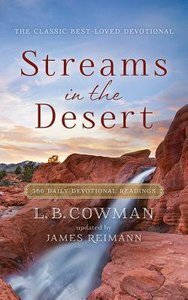 About "Streams in the Desert (Unabridged, 3 Cds)"
Also know as Mrs. Charles Cowman and Lettie B. Cowman. She worked as a pioneer missionary with her husband in Japan and China from 1901 to 1917.